Warning Beware of Fake C.O.A./ Fraud Authentication Companies. 6.) GIVES INFORMATION WHERE YOU CAN VERIFY THE AUTHENTICITY (normally will have a hologram or item number - and a website with Data Base and Authentictors Names.The number one question is who examined and authenticated the item that is represented by the Certificate Of Authenticity. The Authenticator and his credentials should be shown on the Certificate and on the website.
"" No Names, No Phone Number, No Address, No Credentials = Stay Away! The Autograph Authentication Company must provide you with contact information. If they do not, don't deal or trust them.... Name, address and telephone number. The Autograph Authentication Company may provide a "brick and mortar" address that may not exist. Always check your sources. Don't be fooled.! Enter the address to see if it's where they say it is.Don't buy into the COA / Certificate of Authenticity! Most often, it's not worth the paper it's printed on. If a seller is willing to forge an autograph, he will most definitely print out a C.O.A. 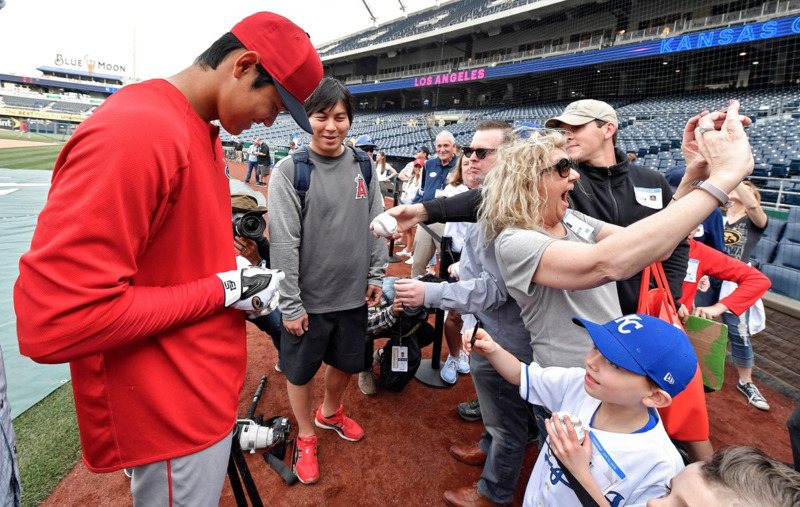 Shohei Ohtani does signs autographs for fans. Shohei Ohtani born July 5, 1994) is a Japanese professional baseball pitcher and designated hitter for the Los Angeles Angels of Major League Baseball (MLB). 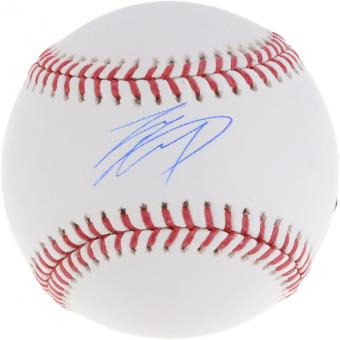 He previously played for the Hokkaido Nippon-Ham Fighters of Nippon Professional Baseball's (NPB) Pacific League: This 23 year old phenom does sign autographs for fans. He is in big demand at this time but is accessible at the ball park, hotel and at spring training. 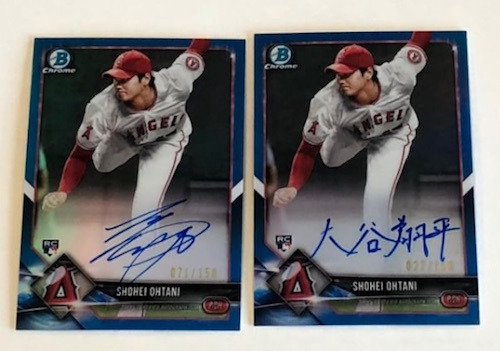 The prices of Ohtani autographs are greatly inflated at this time as in most cases with new highly publicized players. Autographed Baseballs are selling at $200-$500 Autographed Bats and Jersey's are selling at $900 -$1400 Photographs and cards are selling at $200-$++++ . Once the dust clears on this future superstar his autograph will stabilize with baseballs in the $125-$200 range and Bats and Jersey's in the $ $600 range. Michael Frost, (P.A.A.S) has authenticated "The Most Historic Beatles Autographed Item." Roger Epperson Authentication Ltd. (REAL) and Michael Frost, Professional Autograph Authentication Services Inc. (P.A.A.S) have authenticated The Most Historic Beatles autographed item ever offered at auction. " The 1964 Signed Ed Sullivan Show Contracts - 4 Separate Contracts John W. Lennon, JP McCartney (Paul McCartney), Richard Starky (Ringo Starr) and George Harrison and the original contract that was signed by Epstein and Robert H. Precht , Ed Sullivan Producer." We love them, Yeah, Yeah, Yeah. Beatlemania in the United States had its start on February 7, 1964. It was a seemingly normal day as the Pan Am Yankee Clipper flight took off from London’s Heathrow with The Beatles in tow ready for their first visit to the United States. After the jaunt across the pond, they arrived at John F. Kennedy Airport in New York City with quite an introduction. They were met with a near riot as 3,000 teary-eyed and hysterically screaming fans strained for just a glimpse. Dressed in mod-suits and sporting their trademark pudding bowl haircuts, the Fab Four did their famous press conference at JFK for their eager listeners. 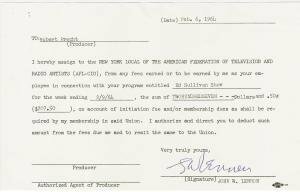 Beatles Ed Sullivan Contract Little did they know that the JFK arrival was just the beginning of Beatlemania. Two short days later, Paul McCartney, Ringo Starr, John Lennon and George Harrison were ready for their real introduction to all of America on the beloved Ed Sullivan Show. An estimated 40% of the U.S. population (73 million), tuned in to watch the performance muffled by the screams of teenage girls in the studio audience. This performance on the Ed Sullivan Show was their true arrival into the iconic adventure of American music and pop culture history. Beatles Ed Sullivan Contract But what was the engine behind the scenes that actually made it happen? The answer is presented here in this very offering. It is the contract that put into motion and finalized their commitment to the Ed Sullivan Show. This particular agreement would have been on file with the show’s production company. It was basically, a deduction of dues agreement to the AFL-CIO and it was signed for the producer of the show Robert Precht by each member. NEVER before has any contract or document surfaced with their full name handwritten signatures disclosing the details of the Ed Sullivan performance. And here it is And yes that’s right, it is important to note that they are signed formally with their full names as any contractual document would be. They signed, J. W. Lennon (John Winston Lennon), J.P. McCartney (James Paul McCartney), George Harrison and Richard Starky (Ringo Starr). Any Richard Starky signature alone makes this a tremendously impossible find. 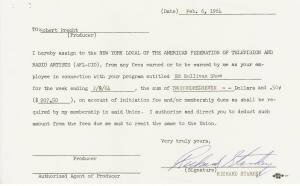 Beatles Ed Sullivan Contract The owner was inspired by the 50th Anniversary of the Ed Sullivan Show and a recent 1960s CNN documentary to bring these contractual documents to the public light. With the magnitude of the documents importance, it was necessary to get renowned autograph authenticators Roger Epperson '"Real" and Michael Frost "P.A.A.S." to examine and authenticate these historic documents. “The autographs being fully hand written, “J. W. Lennon (John Winston Lennon), J.P. McCartney (James Paul McCartney), George Harrison and Richard Starky (Ringo Starr) would fetch mid to high six figures. These particular signatures are binding the Beatles to the 1964 Ed Sullivan show on a formal document and contract. There’s no telling what price a collector would pay for them.” Each 9×6 document reads : “To Robert Precht, I hereby assign to the New York Local of the American Federation of the Television and Radio Artists (AFL-CIO), from any fees earned or to be earned by me as your employee in connection with your program entitled Ed Sullivan Show for the week ending in 2/9/64, the sum of Two hundred seven dollars and .50 cents $207.50 on account of initiation fee and or membership dues as shall be required by my membership in said Union. I authorize and direct you to deduct such amount from the fees due me and to remit the same to the Union. Very truly yours, –” The Release was created the day before the Beatles arrived in America which was February 6, 1964. The Beatles arrived on the 7th, and when they came into the Ed Sullivan Theatre, it was there that they signed these documents. Within the original Contract signed by Epstein, provisions and rules are very prevalent as to how the contracts must be completed and written in order to ensure they were following the union guidelines. This is another reason that the Ed Sullivan Release is so significant. Each and every part of the documents had to be carefully executed in order to get the Beatles on stage. 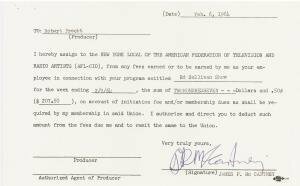 Also be offered in this auction;., Offered is the original contract that was signed by Epstein and Robert H. Precht, Ed Sullivan Producer, on November 18, 1963. Brian Epstein was the manager for the Beatles and was the one who contracted the deal for the Beatles to appear on the Ed Sullivan Show. The 8.5 x 11 contract for the Beatles was sent back and forth from NY to England to make sure that all the provisions were correct. 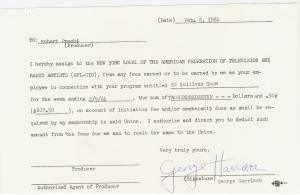 Some corrections needed to be made in regards to the Beatles “Billing” for the show, so they had to VOID this contract once the provisions were corrected. Hence, the reason for the word “Void” written in the right hand corner in blue ball point. The Beatles were paid $3,500 to be divided among the four band members, plus airfare. Not a bad deal for the Fab Four performance. 1964 Original Ed Sullivan Contract For the Beatles -Signed by Brian Epstein Included with the original contract, other correspondence letters are included. 1. December 1963 Confirmation of Contracts to Brian Epstein-Stating the Beatles to have Top Star Billing-2 Page Letter-requesting to revise the contract. 2. Jack Babb CBS Letter stating that NEMS Enterprises was going to be filming the concert in Washington DC for TV purposes, Dated February 14. 1964 3. Mr. Bernard Stebel, Letter confirming rights to Closed Circuit filming between 7 Arts Productions and or NEMS. Authentication These historic pieces of autographed memorabilia have been personally examined and authenticated by Michael Frost of P.A.A.S. and Roger Epperson of "REAL".